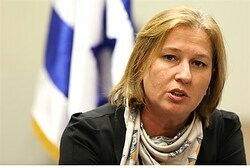 Justice Minister Tzipi Livni, who is heading the Israeli team for peace talks with the Palestinian Authority, said Sunday that Israel should ignore the terrorists who carried out the bus bombing in Bat Yam and continue with the peace process. Livni, who spoke at a special conference marking Quality Government Day, said that the Palestinian Authority with whom she is negotiating is not behind the terror attack. “Those who tried to harm us today are not those with whom we are conducting or will conduct negotiations,” she insisted. “We will not allow criminal terrorists to determine Israel’s future. Israel continues to act against terrorism and in this case too, if it is indeed terrorism like it appears, we will do what needs to be done,” added Livni. Police have confirmed that based on their initial investigation, the explosion on the number 240 bus from Bnei Brak to Bat Yam was due to a bomb placed by Arab terrorists. Both the Hamas and Islamic Jihad terror groups welcomed Sunday’s bus attack, though neither group claimed responsibility for the bombing, in which one officer was lightly wounded. The Palestinian Authority and its head Mahmoud Abbas, with whom Livni is holding peace talks, has yet to condemn the attack. Livni also ignored the fact that PA leaders continue to glorify terrorism, and remain insistent that all descendants of Arabs who fled pre-state Israel be allowed to “return,” effectively turning Israel into an Arab state. Erekat: Abbas willing to meet Netanyahu in Moscow PLO Secretary-General says PA chairman willing to attend three-way peace summit in Russian capital.